In this day and age of internet communication, letter writing has gone by the wayside. However, there are exceptions for special occasions… like writing a letter to Santa! Ava begins a year-long letter exchange with Santa in January. She thanks him for the gifts he sent and asks why he didn’t eat the cookies she left him. Santa replies that he is very excited to receive a letter in January and that although he loves cookies, he’s trying to cut back on his sweets. In February, Ava wishes Santa a Happy Valentine’s Day and asks why he signed his last letter ‘Merry Christmas’ when Christmas was over. Santa explains to her that he loves Christmas and says Merry Christmas all year long. The letters continue throughout the year. With each letter, Ava asks another question and learns more and more about Santa. He tells her that he has never met the Easter Bunny although he did run into the Tooth Fairy once, that it’s okay for some people not to believe in him, that he has a special greenhouse at the North Pole where they grow their own vegetables and Christmas poinsettias, that he doesn’t like to give coal because it makes his hands dirty, that he can see the fireworks from Alaska but usually he just watches the shooting stars at night, that he and Mrs. Claus like to take a vacation before they start their busy season, that he doesn’t celebrate his birthday but he knows that he’s older than her parents, grandparents, and great-grandparents, and that he’s happy that many people give gifts because he would need a much bigger sleigh if he did all the gift giving on Christmas Eve. In her final letter, Ava only asks for one gift for Christmas… to meet Santa Claus. And the final picture in the book is a picture of Ava giving Santa a plate of carrots on Christmas Eve. Have you ever wondered where Santa lives, how he flies, how he gets down chimneys, or why no one has ever seen him? Children have written letters to Santa asking these exact questions. For each letter, Santa write one in return. 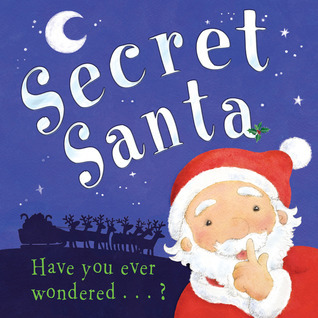 Each of Santa’s letters begins with the words ‘I shouldn’t tell you this but…’ and ends with ‘Remember this is Santa’s secret… so shhhh!’. 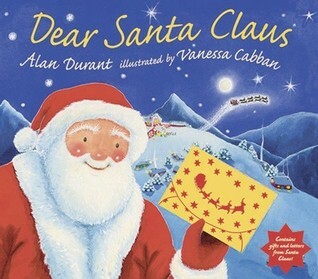 Not only is this a fun series of letters to read, it’s also a fun pop-up book with great pictures showing each of Santa’s answers. 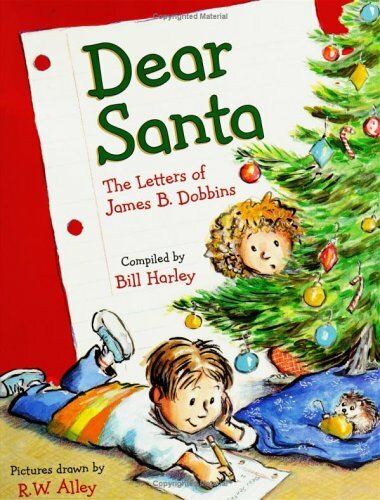 James B. Dobbins, aka James Dobbins, aka Jim Dobbins, aka Jimmy Dobbins, aka Jimmy, writes a series of letters to Santa one year. He begins with and extremely long wish list. His second letter is another request, assurances of his ‘goodness’, and his offer to mail his annoying little sister to him to work as an elf. With each letter, James B. Dobbins becomes more and more familiar in his signature as if he and Santa are becoming the closest of friends. He sends reminders of his wish list, more assurances of his ‘goodness’ especially with his little sister (which isn’t easy), and some very creative explanations of misdeeds. One of my favorite letters is dated FOUR DAYS TO GO: Jimmy tells Santa about giving his teacher a pencil holder he made himself. He talks about how much fun it was to watch her open it. He wonders why Santa doesn’t hang around a little longer to watch kids open their gifts… like he says ‘it’s the best part’. 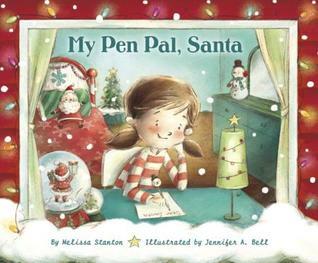 Then the last letter he writes is dated FIVE HOURS BEFORE CHRISTMAS and signed ‘your old pal, Jimmy’: Jimmy amends his wish list to something more realistic and invites Santa to come to his room to say ‘hi’ because he knows he won’t be asleep (but don’t go into his sister’s room by mistake) and he leaves Santa a gift also. Holly and her little brother Billy visit Santa at the mall. When they get home, Holly’s mother helps Billy write his Christmas Wish List, but Holly doesn’t write her list… she writes a letter instead. That night Billy’s list is whisked to the North Pole, and in place of Holly’s letter is a letter from Santa. He answers her question and reminds her to write her list before it gets too late. But instead, Holly writes another letter with more questions. Santa answers her again, but reminds her to send her list or his chief elf will get very grumpy. Holly knows she’s pushing her luck a little bit, but she writes another letter. Santa answers her questions again. Finally, Holly is brave enough to ask Santa what she really wants to know… it’s her only Christmas wish. On Christmas Eve, Holly watches Santa from her bedroom window. He shows her a special ticket to ride with him on the sleigh. The next morning, Holly finds the ticket on her bed so she knows it wasn’t a dream. Santa really did grant her Christmas wish. And a couple of old favorites. The Jolly Postman is back in the fairy tale zip code, this time delivering holiday mail. The first stop is the home of the Three Bears. Goldilocks has sent them a Christmas card with a joke she made up herself. Next, he rides his bike to Red Riding Hood’s house to deliver a package from Mr. Wolf. It’s a game for her to play. Only one mile away is the hospital where the Jolly Postman delivers a Get-Well card from the Royal Barracks to their friend, Humpty Dumpty. Then the Gingerbread Boy receives a book from the Pat O’Cakes Bakers. On to the den of Mister Wolf with a special edition of The Wolf Spotter’s Guide. And the final stop on Christmas Eve, is Santa’s Workshop with all of the last minute letters to Santa. 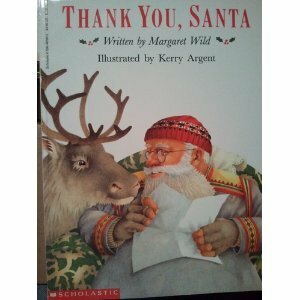 He has a cup of tea with Santa and Mrs. Claus, and receives a package of his own. Santa has given the Jolly Postman a fold-out picture card from all his friends and a ride on his sleigh back to his own home, bicycle and all. I wrote a blog post about this book last December. It had been a classroom favorite of mine, and I have a little history about how I used it in the classroom after the winter break. There is a brief synopsis of the story there too. Please go back and see it HERE. These look wonderful! Thanks for introducing my, Juliana! Well, they are Santa books, and I LOVE SANTA!